Mt. 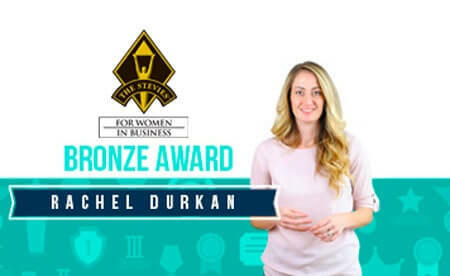 Tabor, N.J. – Paradigm Marketing & Design is pleased to announce that our founder and president, Rachel Durkan, was awarded a Bronze Stevie Award at the 15th Annual Stevie® Awards for Women in Business dinner in New York City on Friday, November 16. Durkan was one of 13 nominees in the category of Female Entrepreneur of the Year, Business Services, 10 or Less Employees. The Stevie Awards for Women in Business honor women executives, entrepreneurs, and employees, as well as the companies they run – worldwide. The Stevie Awards have been hailed as the world’s premier business awards, and the annual gala event is notoriously well attended by nominated women executives and entrepreneurs from the U.S.A. and several other countries. 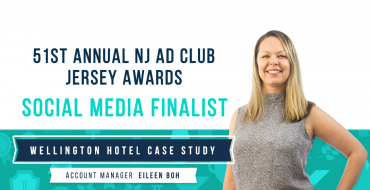 This year’s event, held at the Sheraton New York Times Square Hotel in New York, featured 500 businesswomen and their guests from Australia, Canada, France, Germany, Hong Kong, Switzerland, the United States, the United Kingdom, and Vietnam, among others. Durkan – nominated for her incredible drive and outstanding reputation as a female business owner – founded Paradigm upon the ideals of teamwork, collaboration and success. When she first founded the company, she wore many hats; but after quickly realizing that being good at so many things would never allow her the time or the ability to be great at any one thing, she began to seek others with a shared entrepreneurial spirit and built an organization that has evolved over the years into a full-service marketing and design agency. As President, Durkan is responsible for the development of the agency’s long-term growth strategy and works each day toward cultivating a culture of entrepreneurship and ensuring that her team is able to uphold the company’s values: taking a vested interest in client success; supporting team members in all things; and striving for excellence in everything they do. Outside of Paradigm, Rachel’s positive influence knows no bounds. 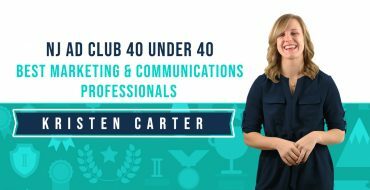 She serves as a highly regarded mentor to fellow women business owners who are just starting out – helping them grow their businesses at no cost to them – and is currently mentoring a young woman in the process of founding her own public relations firm. Rachel is also a member of the Morris County Chamber of Commerce and the Women Presidents’ Organization (WPO), an organization of women leaders who support one another personally and provide each other with professional guidance. Prior to founding Paradigm, Durkan got her start as a Professional Sales and Marketing Assistant for the pharmaceutical giant Pfizer and later worked as the Marketing and Communications Manager for Bergen County’s United Way, a $12 million-per-year nonprofit organization. Finalists for the 15th Annual Stevie® Awards were determined by the average scores of more than 200 business professionals around the world, working on five juries. Their scores also determined the Gold, Silver, and Bronze Stevie Award placements. Stevie Awards are conferred in seven programs: the Asia-Pacific Stevie Awards, the German Stevie Awards, The American Business Awards®, The International Business Awards®, the Stevie Awards for Great Employers, the Stevie Awards for Women in Business, and the Stevie Awards for Sales & Customer Service. Stevie Awards competitions receive more than 10,000 entries each year from organizations in more than 70 nations. Honoring organizations of all types and sizes and the people behind them, the Stevies recognize outstanding performances in the workplace worldwide. Learn more about the Stevie Awards at http://www.StevieAwards.com.